Introducing In theBalm of Your Hand Vol. 2, the second edition of our coveted all-in-one face palette. This all-inclusive must-have features 4 blendable eyeshadows, 3 flattering blush colors, a matte bronzer and champagne-hued highlighter. Limitless looks await with everything you need “In theBalm of Your Hand”! Let's be honest.... I have been lusting over this palette for a LONG time! 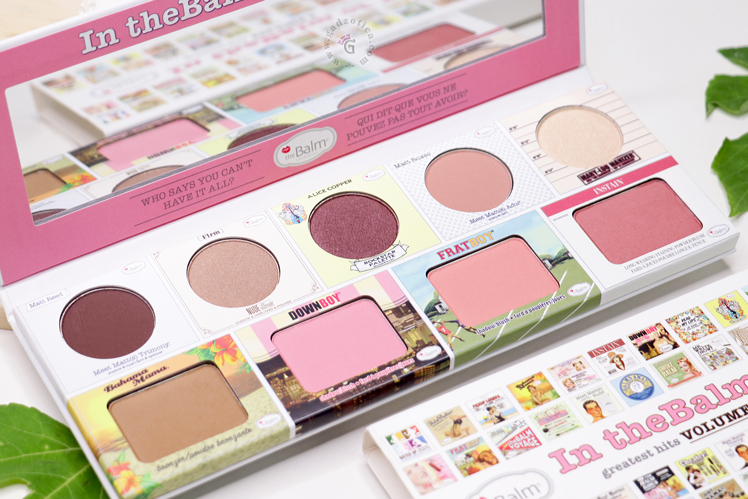 I've looked at TheBalm products for ages & read lots of reviews but have never bought any. Packaging – Oh yes! I love the cute packaging TheBalm does - their graphic designers rock & certainly helped me in making the purchasing decision. This palette comes in a sturdy white cardboard packaging with a collage picture of all the balm face products in their original packaging. It's attractive and I like the big mirror in the inside flap. Pigmentation and Texture – All the shades are highly pigmented. A little goes a long way with all the products so definitely apply with good brushes to get the best out of the product.The blushes are smooth and buttery and blend beautifully into the skin. Their blushes have a really good reputation because of their amazing quality and how nicely they blend and these mini sizes are no exception. Am I happy? - Oh Yes! Very happy in fact! I'm glad I spent the money and got exactly what I wanted... I haven't been disappointed and looking to purchase some more of their products now.